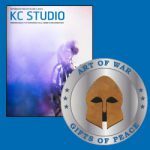 On Aug. 15, U.S. Navy veteran and Kansas City freelance writer Anne Kniggendorf visited the U.S. Army Command and General Staff College to explore the background of the CGSC Foundation’s Art of War Initiative. Freelance writer Anne Kniggendorf, left, explores the CGSC art and gift collection with reps from the Todd Weiner Gallery Aug. 15. From left, Kniggendorf, Meghan Dohogne, Poppy Di Candeloro, and Todd Weiner. 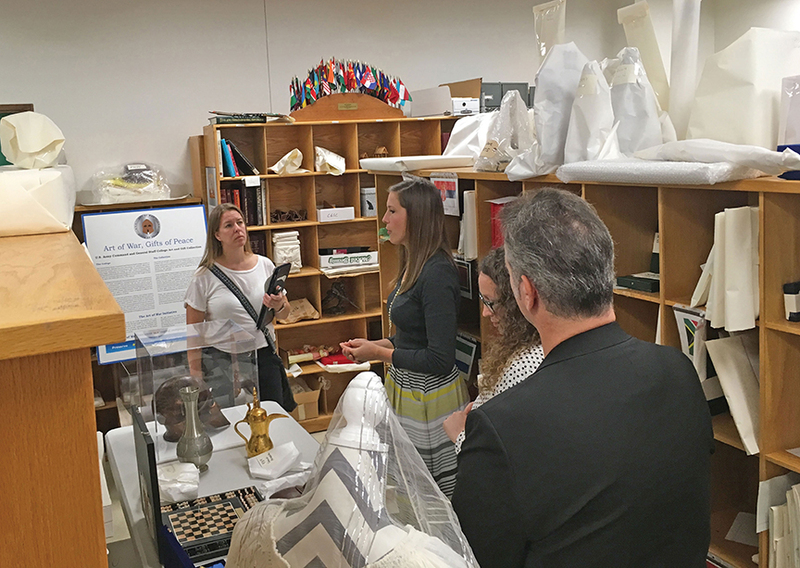 During her visit to CGSC, Kniggendorf visited the storage area in Eisenhower Hall where the CGSC’s art and gift collection is kept to see how the College accounts for the nearly 4,000 gifts of art and other items it has amassed over the years. Kniggendorf was met by representatives from the Todd Weiner Gallery in Kansas City who have been working with the Foundation and the College to inspect the collection and select items for curation and public display and help plan for its future. Gallery owner Todd Weiner, assistant gallery director Meghan Dohogne and Poppy Di Candeloro, an independent curator and researcher with the gallery, met with Kniggendorf to provide background on their efforts with the initiative and show her some of the objects. After her time in the collection storage area, Kniggendorf had the opportunity to sit down with CGSC Chief of Staff Jeff LaMoe, who provided her with a background briefing on the College and its role in educating military officers not only from the U.S. Army, but from other services and nations as well. LaMoe also spoke with her about his responsibilities for ensuring that all of the College’s property, including the art and gift collection, is managed properly. She also had the opportunity to speak with a Spanish military officer who presented a gift to CGSC upon graduating from the Command and General Staff Officer’s Course (CGSOC) in June 2017. He is currently a student in the School for Advanced Military Studies (SAMS) course. The vision of the CGSC Foundation’s “Art of War Initiative” with the College’s art and gift collection is to “preserve, educate, celebrate and engage.” – Preserve it by fully cataloguing the collection; educate the public about it with published and video projects; celebrate and engage it by using objects from the collection in exhibits both within the college and the community; plan for the future with an endowment; and finally, protect the collection by designing and re-imagining the collection storage and display for the foreseeable future. The CGSC Foundation is continuing to work with CGSC leadership and the Army to explore how the Foundation can bring the initiative to reality and embark on an Army-approved program to preserve and promote the collection. The Todd Weiner Gallery is assisting the Foundation with their energy and expertise in all areas of the initiative. Learn more about the initiative on our About pages. 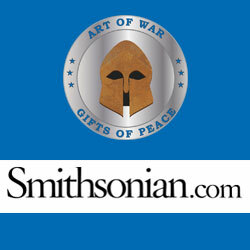 Kniggendorf’s article was published on the Smithsonian Magazine’s website www.smithsonianmag.com, Sept. 14. Click the image below to visit the site and read the article or use this link.